Soaked in tomato sauce, flavored with all the necessary spices, this is the best – if not the only- way to make my kids eat veggies. Tomato sauce lends any veggies a desirable taste specially for little tummies. In fact, this is how we usually eat our veggies in the Middle East. I wanted to introduce you to this way of veggie cooking a long time ago and when Maryam encouraged us at MENA to cook some of the wonderful Iraqi dishes, I’ve seen the chance I was waiting for. This way of veggie cooking is almost how we eat our daily veggies in the Middle East, you can use it to cook okra, peas, green beans, zucchini, …. you name it. Not only delicious and appealing but also very easy to make. 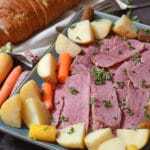 You can skip the beef and make it frugal 🙂 or you can add some minced meat, but this way does not go well with chicken, so I do not recommend substituting beef with chicken. I was wondering when I first landed in the US, how do people here eat the veggies?, and was so surprised that they do not just put it with tomato sauce. I hope you’ll try this way specially if you are having trouble convincing your kids to eat their veggies. Can be served with white rice or pasta. 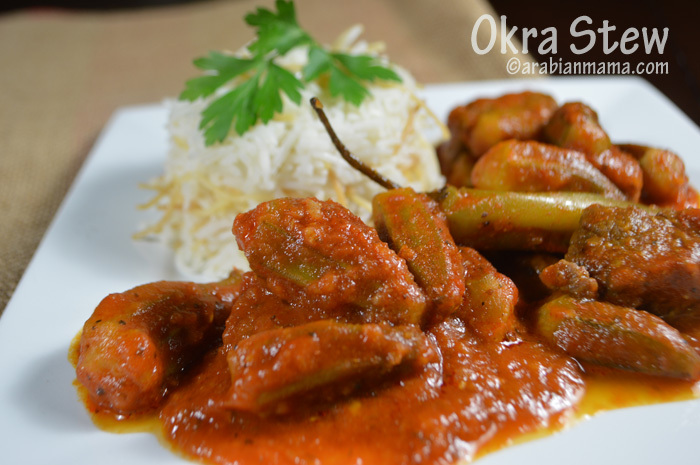 Here is a short video on how to prepare okra stew on my youtube channel. 1 pound of okra- fresh or frozen. 1 pound of beef stew boiled and cooked. 2-3 cups of tomato sauce. Add the tomato sauce, the okra, salt and pepper and stir to combine. Cover and let it cook. Check for doneness and liquid level every 15 minutes. When it is almost done, after 35-40 minutes, add the cooked beef. Let it simmer for another 10 minutes. 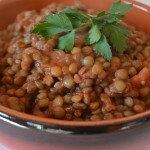 Serve hot with white rice or pita bread. Usually served with a squeeze of lemon juice. Very important to regularly check the liquid level in the pot. If the liquid level is too low add a cup of water/stock at a time to prevent it from burning as okra tend to burn quickly. Enjoy the rest of the week. Do not forget to check out the other members for this month’s Iraqi cooking. Can you explain more what you mean by 1 pound of beef stew boiled and cooked? Thanks! Sommer, sorry for the confusion dear :). I meant fully cooked, like when you make beef broth. Traditional way is, you fill a pot with water, place a medium un-chopped onion in there along with some bay leaves, may be a couple of cardamom pods then when it is boiling, add the beef stew and continue to simmer until the beef is totally cooked. I hope this will help, let me know if you have any further wuestions. As you know, I’m not a huge fan of okra. 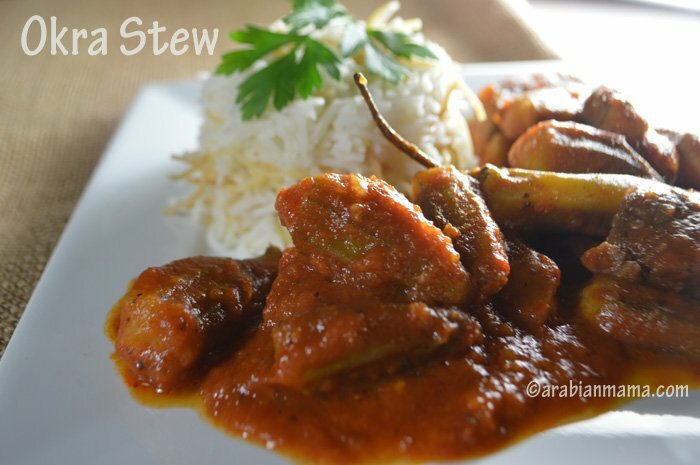 I have had this okra with meat stew and I actually liked it 🙂 Yours looks really good!! And I’m sure the kids love it! Kids are funny, my 17 yr old, has never liked fresh tomatoes, but loves pizza, ketchup, this kind of stew… Every tomatoey thing but tomatoes themselves! Looking at this dish I feel I should try it now. Really good. Definitely a great way to eat veggies and I actually LOVE orka so bookmarked to make for sure! Truly this is how we like it! Beautiful adaptation of the recipe. Thank you for participating in this month’s challenge. I have seen okra being used in stew but never tried it in my kitchen. We usually make a dry preparation of okra. I like how you used it with meat here. G’day Thanks Amira for allowing me to learn something new! 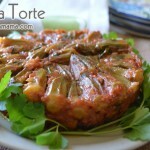 While not a fan of okra, your dish looks delish! Okra is a fave of mine. I love both in stews and in beans. Your stew looks quite delicious and the best part is meatless. I love tomato sauces! And depending on how you spice them, they take on so many different characters. This is just wonderful — okra is so nice, isn’t it? And combines well with tomato. Good stuff — thanks.